Digital speedometers in cars are nothing new, but recent years have seen the introduction of even more advanced LCD monitors and upgraded display technology. While these high-quality displays have become de rigor in luxury vehicles, they will likely soon be making their way into more affordable compact models as well. These digital all-round displays show more than just speed, revolutions and electric range; they also provide information about weather, navigation, traffic, music and even notifications from your mobile phone. “Digital displays make driving safer, because people take in 90 per cent of sensory information through their eyes,” says Sajjad Khan of Mercedes. In its new A-Class, the German carmaker will do away entirely with analogue displays, instead opting for two adjacent 7in screens. 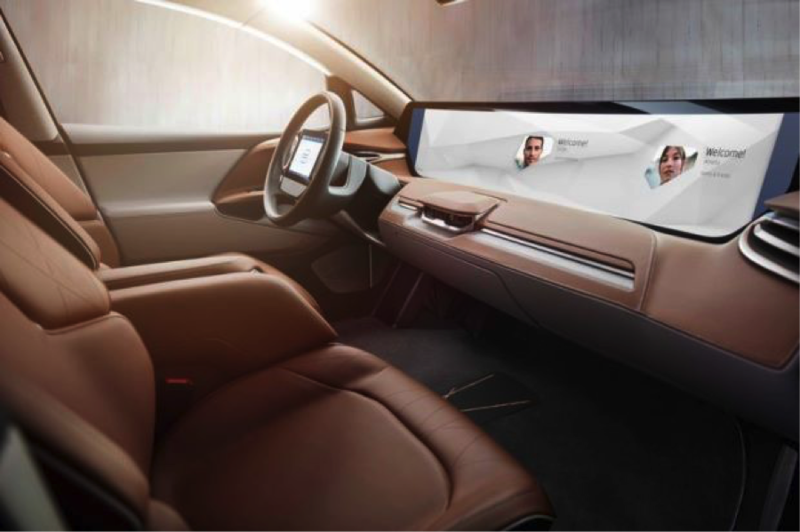 Buyers will also have the option to install 10in displays, offering various display modes and flexible configurations depending on a car’s equipment and features. However, just as important as the size of the screens and their different display options are their responsiveness. “No user wants to wait seconds for an answer these days,” says Khan. “It has to come in real time.” This applies to touch commands, as well as visual map layouts and voice control. ​At new Chinese manufacturer Byton, one concept car’s cockpit consists of a 1.25m wide and 25cm high monitor. It can be operated by touch, but also by gestures, facial recognition and voice commands. An additional tablet in the middle of the steering wheel gives information about speed, as well as vehicle controls and information. “The monitor can be customized and divided into three sections,” says Henrik Wenders of Byton. Video clips, navigation information and even a health programmed can appear in the display. Meanwhile, suppliers such as Continental, Bosch, Faurecia, Valeo and ZF are developing their own increasingly advanced systems. Bosch is working on two digital cockpits that can be controlled by touch or voice. The touchscreens feature haptic feedback, while 3D elements on the edge of the display can be operated like sliders, rendering any buttons superfluous. In the Concept 2020, ZF is likewise developing a digital cockpit with as few buttons as possible. A 12in monitor provides all necessary information, while a self-diagnostic program includes a 3D diagram that shows where the car is experiencing any issues. “The focus is on simplifying the depictions. The visual communication with the driver should be as intuitive as possible,” says Uwe Class from ZF. ​Professor Dieter Nazareth, Dean of the Faculty of Computer Science at Landshut University of Applied Sciences, foresees voice controls like Siri and Alexa making their way into cars soon. “The trend is heading in this direction, because voice is the primary mode of communication for humans,” says the automotive software expert. For him, it is incomprehensible that modern cars still have instrument clusters with mechanical indicators. “Displays are more flexible, and can be used to show more information,” says Nazareth. Nazareth estimates that manufacturers will combine voice control and touchscreens, but considers gesture control to be unnatural. Particularly for continuous values like speed or revolutions per minute, cars need a visual representation. “No car driver wants to constantly receive this information by voice,” he says. Spoken indicators are more effective when used, for example, to advise about approaching black ice or warn that the fuel tank is close to empty.